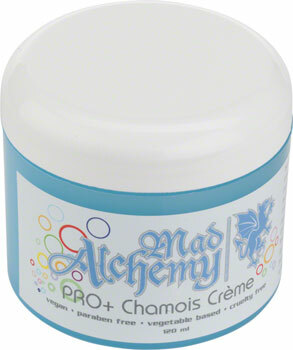 PROPlus is a thicker more viscous version of our Mad Alchemy’s PRO Chamois Cream. Customer feedback has lead us to these improvements and we think you’ll be very happy with the changes. Give it a try! As before, ProPlus Chamois Creme is a gentle, veggie based, more traditional, chamois creme, made from the highest quality ingredients available. ProPlus is a superior product and great addition to everyone’s race day carryall. Like Pure Chamois Grease and Skin Protectant, ProPlus Chamois Creme uses natural essential oils, but does so in a more stable, bullet proof formulation. Mild additives and preservatives makes ProPlus Chamois Creme perfect for those on the go. 4 fl oz.